Now this is technical/progressive death metal with flair, uniqueness, and accessibility. Whereas a capable band like DECREPIT BIRTH — whose latest is impressive as well — is filled to the brim with chops and better than average song structuring, THE FACELESS never, ever sacrifices the central essence of the song for blinding instrumental wizardry. In that sense then, the description of "progressive" death metal does indeed do more justice to an album like "Planetary Duality" than does tech-death, as do the obvious CYNIC reference points. Michael Keene (guitar/vocoder/clean vocals and producer) clearly had a focused vision for the kind of album he wanted "Planetary Duality" to be and it comes across big time. The classically inspired riffs and solos are not only enticing for the discerning accomplished musician, but they also sound fantastic, and it doesn't take a degree in music theory to hear it. It either sounds good or it doesn't; on "Planetary Duality" it all sounds good. The songs are filled with exciting and exquisite moments of musical showmanship that never grow into epic meandering pieces or shred fests. Taking cues from the aforementioned CYNIC, Keene's vocoder effects are perfectly placed amidst the growls of vocalist Derek "Demon Carcass" Rydquist. Additionally, Keene's brief clean vocal lines on "Coldly Calculated Design", "Sons of Belial", and "Planetary Duality II (A Prophecies Fruition)" are pleasantly tuneful and memorable. Even the short, keyboard-driven/lightly-picked, melodic interlude "Shape Shifters" is an essential part of the album. The band isn't afraid to ride tough, fundamentally chugging parts either, as aptly demonstrated on "The Ancient Covenant". Never does one feel as though compositional segments are thrown together without concern for the song, a feat that is in no way easy to accomplish within the context of such challenging arrangements. Whether the spoken sample about extraterrestrial invasion on "Planetary Duality I (Hideous Revelation)", the piano/drum segment, the black metal-esque section and MESHUGGAH rhythm stutters of standout "Xenochrist" or the effective use of sparkling keyboards on several cuts, everything keeps coming back to the song. The lyrical themes about "inter-dimensional beings from another planet similar to our own" and our awareness of only one dimension of existence are just as intriguing. This band's potential is limitless. 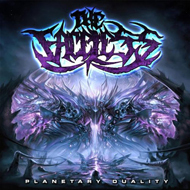 In the way of summation then, "Planetary Duality" is an exceptional progressive death metal album. You cannot go wrong with this one.